TUI Cruises has new ships coming in 2018, 2019 and 2023, and will now keep the existing Mein Schiff 2 for the immediate future, representing continued significant capacity growth for the German brand. Wybcke Meier, CEO, said the Mein Schiff 2 would stay in the fleet for the time being following Royal Caribbean Cruises’ decision to wind down its SkySea brand in China, setting off a chain reaction of fleet changes across Europe, also involving Marella Cruises, which will get SkySea’s ship in place of the Mein Schiff 2. 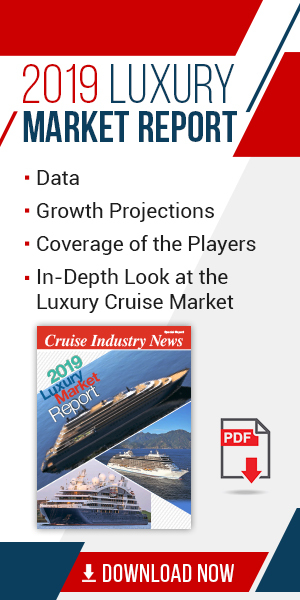 TUI will have six ships in service this year, with an estimated 14,784 berths and a market capacity of just over 500,000 cruise guests, according to the 2018-2019 Cruise Industry News Annual Report. According to Meier, in recent remarks at an industry event, German market growth has driven by new tailor-made capacity being added to the market. “The Germans are attracted to the German cruise concept and that’s what we have been doing for the last five years,” she said, adding that TUI has built five ships since 2013. The capacity was well absorbed by the market and there’s still room to grow, she said. Meier also believes that the growth in Germany is tied to the various cruise options available. “Now you have a different cruise ship for every kind of customer,” she continued. “Also, there’s still a fascination about taking a cruise in the German market. We are somewhat new to the business, with the first local cruise brand appearing in the 1990s.